Balanced nutrition without extra calories. Contains a balanced mix of proteins, fats, carbohydrates, vitamins and trace nutrients. This is the perfect choice for people who want to lose weight fast. It's delicious and easy to prepare. The shake provides a fully-balanced, healthy meal, and can also be used by people wishing to gain weight if they are underweight. The Energy Diet HD formula contains a unique enzyme complex that improves digestive processes, promotes rapid digestion and facilitates absorption of animal and plant proteins. The absence of GMO has been confirmed by molecular genetic testing at the Russian Academy of Medical Sciences. Energy Diet HD contains 11 minerals and 12 vitamins. These include: iron, copper, zinc, iodine, selenium, and a large amount of calcium. The vitamins include the vitamin B group, vitamin E, which protects against free radicals, and vitamin A, which aids metabolism and is essential for healthy vision. One serving has the stated caloric content when the powder mixture is diluted in 1.5% fat milk. 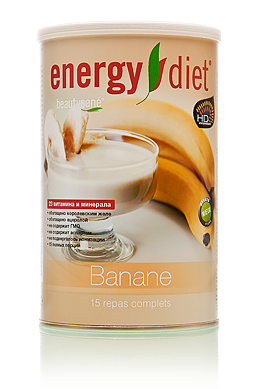 The banana-flavored Energy Diet Shake has a satisfying, exotic taste that won’t leave anyone indifferent. You only need one serving of Energy Diet per day on a regular basis. What’s the result? Each serving contains everything your body needs for proper functioning: a balanced set of proteins, fats and carbohydrates, fiber, 12 vitamins and 11 minerals. Lose weight without being hungry or lacking nutrients. Develop good eating habits — stop overeating and eat less while feeling full. Fast recovery after physical exertion. Excellent health and high energy levels. A shake shouldn’t be your only source of food. You should eat regular food at least once a day and drink at least 2 L of water a day. Pregnant women should consult with a doctor before consuming a shake. For those who want to lose weight. For those who don’t have time for breakfast, lunch or dinner. For those who like tasty and healthy snacks. For those who prefer proper nutrition. Helps to lose excess weight and build the body of your dreams! Good for your health — each serving contains a balanced amount of proteins, fats and carbohydrates, as well as 12 vitamins, 11 minerals and a unique complex of enzymes to improve digestion. Ready in a minute! Just mix with milk. It's delicious! A great selection of your favorite flavors. Animal and vegetable proteins contain a full set of essential amino acids. These are the building blocks for cells in your body. They also balance the work of the brain, restore the endocrine system and aid the enzyme synthesis. Unsaturated fatty acids. The main component, soybean oil, contains a record amount of vitamin E1 (tocopherol) — a natural antioxidant —compared to other vegetable oils. It is highly active in the body and has a 98% absorption rate. Maintain a healthy balance of fast and slow carbohydrates: dextrose (glucose), which is instantly absorbed by the body, versus starch and maltodextrins, which are absorbed throughout the day. The carbohydrate content is calculated so that all the energy is fully absorbed by the body, especially by the brain and muscles, and not stored as fat. Complex of enzymes Highly digestible, improves and accelerates digestion, promotes absorption of animal and vegetable proteins. Fiber — natural dietary fiber: a gum derived from corn tare, and chicory inulin. Fiber has a dual action: it gives you the feeling of being full, and helps to remove slags and toxins. 12 vitamins and 11 minerals including iron, copper, zinc, iodine, selenium, and a large amount of calcium. The vitamins include the vitamin B group, vitamin E, which protects against free radicals, and vitamin A, which aids metabolism and is essential for healthy vision. Acerola is a natural source of vitamins and microelements, with more vitamin C content than virtually any other fruit. It has antioxidant, tonic and restorative effects that aid against fatigue, as well as infectious and viral diseases. Royal jelly is a milk produced by young nurse bees. It contains a large amount of B vitamins, minerals and trace nutrients, amino acids, and unsaturated fatty acids. Royal jelly has a general strengthening effect, stimulates stress resistance, and boosts the body’s resistance to viruses. Soy proteins, dextrose, milk proteins, vegetable oil (soybean oil, dextrose syrup, caseinate, natural flavor), pea proteins, chicory inulin, starch, potassium citrate, acacia gum, calcium ortho-phosphate, nature-identical flavorings, thickening agents (cellulose gum, tare gum), magnesium carbonate, sweetener (acesulfame-K), vitamins (PP, C, E, A, B5, D3, B6, B1, B2, B9, biotin, B12), salt, Acerola Malpighia glabra L. (149 mg / 100 g), ferrous sulfate, coloring compounds (beta-carotene), zinc citrate, royal jelly (31 mg / 100 g), manganese gluconate, copper gluconate, a complex of enzymes, potassium iodide, sodium selenite. Whisking vigorously in a closed container (shaker cup), mix 30 grams (1 scoop) of the product with 200 ml of 1.5% fat milk. The milk's temperature should not exceed 60°C. Shake the jar before first use. Do not consume if you are intolerant to any of the ingredients.